West Australian bush setting meets European farm quadrangle design in this modern home that was recently completed by Mountford Architects. 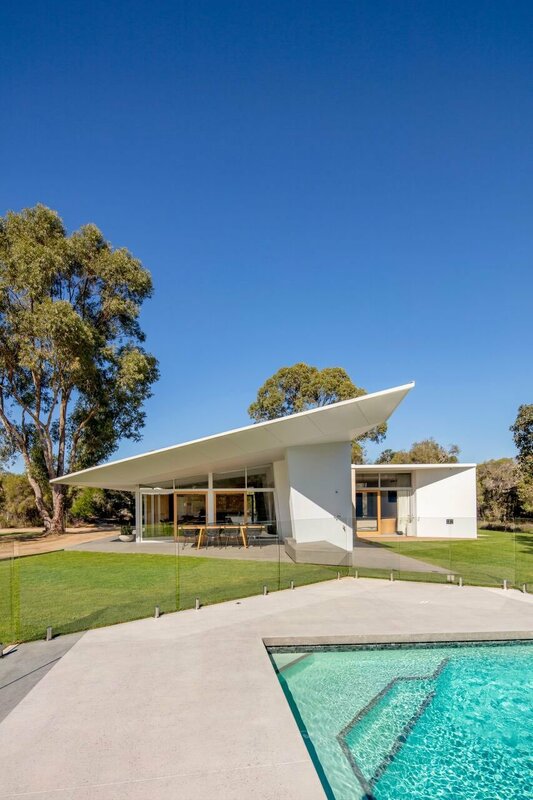 Covering 420 square meters of floor area within 9,150 square meters of entire site, the Bartram Road Resdience can be spotted resting gorgeously on a stretch of the Swan River Basin in Australia’s South West. 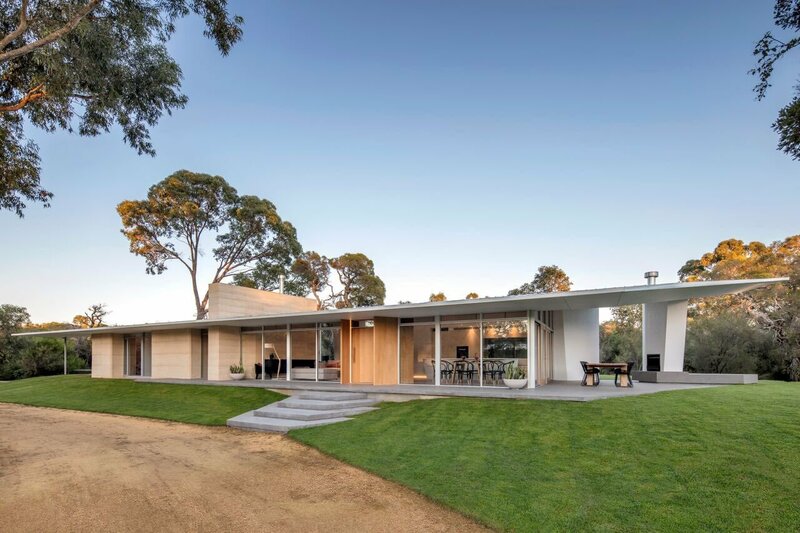 Situated in an Australian Bush environment, it is clear this home was attentively designed to fit into its surroundings as well as to comply with the owners’ rural lifestyle. Resorting to heavy use of floor to ceiling windows along the sides as well as ends of the building, the one story home stretching over an elevated piece of grass area draws on capturing a great deal of natural light. A sloped modern roof not only looks great, but also helps maximize the flow of natural light into the living spaces. The interior design of the home is kept rather tame with a natural color palette of whites, beiges and light colored wood. 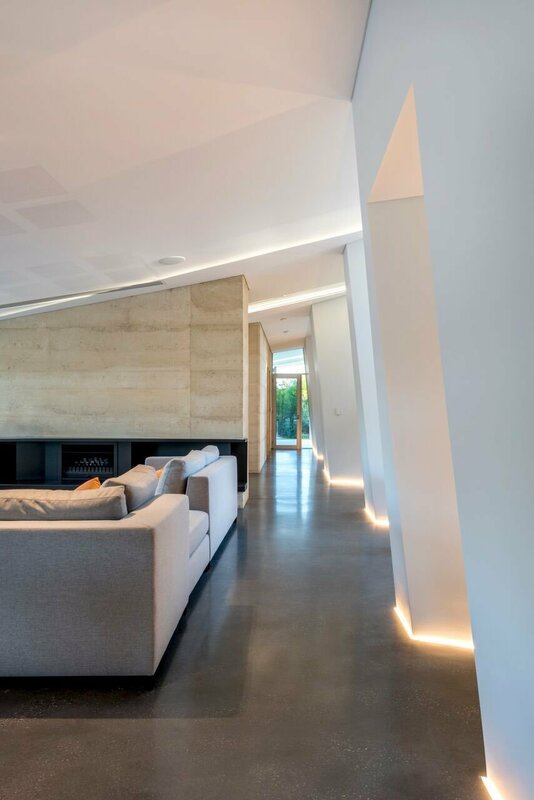 To counterbalance the mild hues, materials have been selected in good taste to stand out; local limestone has been cut out to make for a beautiful, granite floor throughout the building. 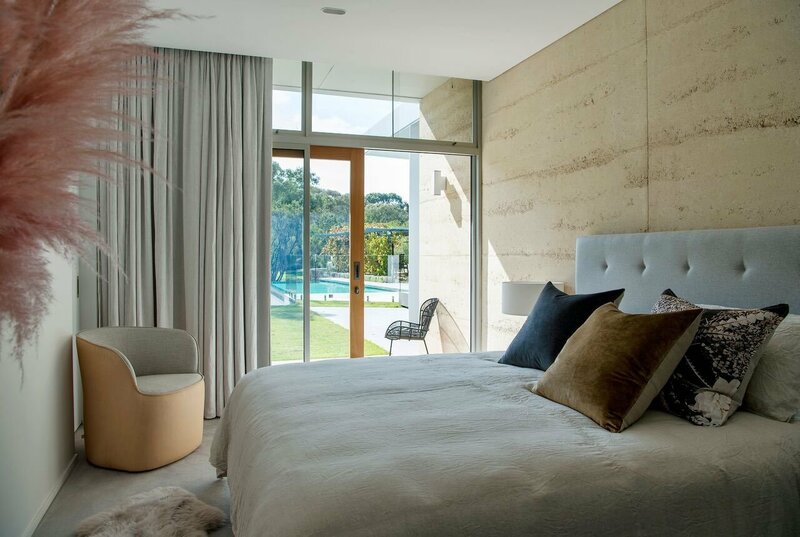 The same limestone adorns the walls of the master bedroom and parts of the living spaces, although here the designers have opted for a light beige coloring. Moving to the lounge area at the end of the house, a large stylish bookshelf is inlaid to the wall with an ingrained couch. 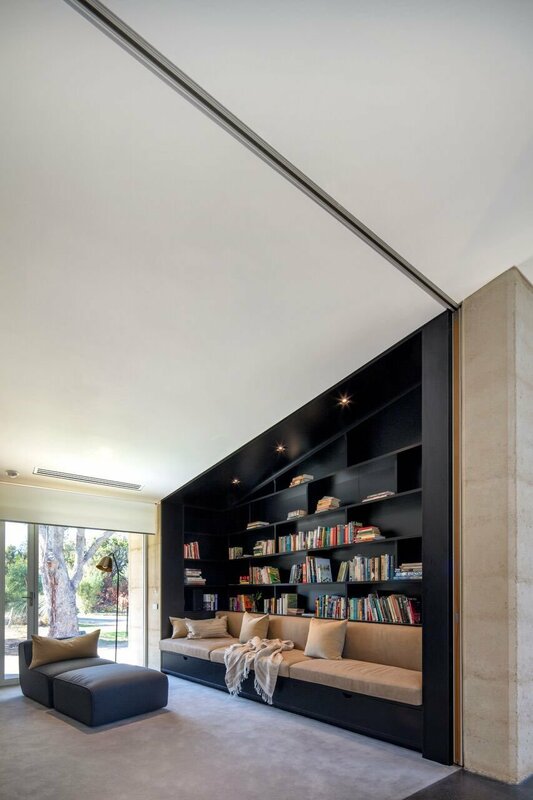 The bookshelves top line mimics the roofline when looking at the home’s facade from this end, and the pitch black color bears a refined stark contrast to the otherwise light interior. The same stark contrast is used to separate the master bedroom from its en suite bathroom – instead of creating an entirely separate en suite bathroom, the architects have placed a bulky, black divider. Floor to ceiling windows deliver a great deal of light into the bedroom at the end of the home, while overlooking the backyard and pool area. On the other side, a minimalist and modern bathtub rests in the middle of an otherwise bare en suite. Here the color palette made up of black, white and light colored natural wood make the space cosy and a pleasure to the eye. Another specific detail to the Bartram Road Residence is the use of more than 300 year old paper bark trees which is placed in long sigh lines inside the home to for the inhabitants to enjoy. 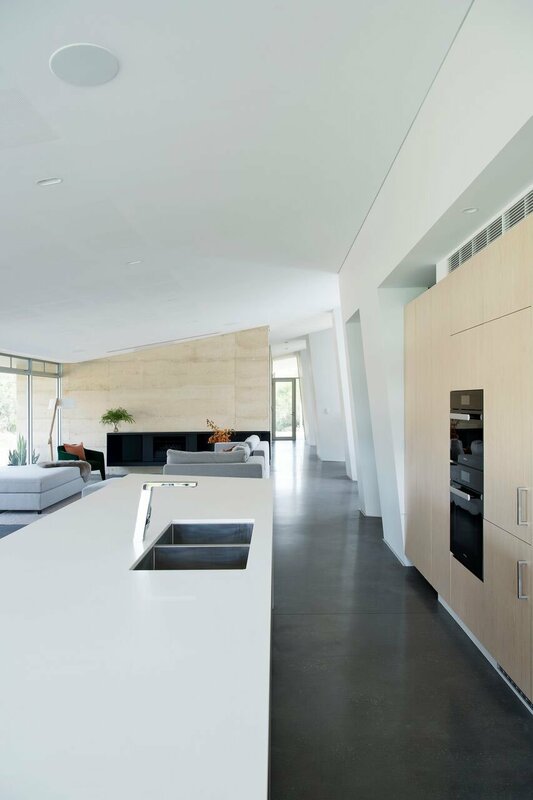 The use of light wood seamlessly ties the home to the Australian bush landscape it resides in.